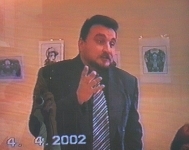 On april 4, 2002, dr. Vladimir Sivitsky organised an exhibition of Aster's Angel Drawings in the Maxim Bogdanovich's Literary Museum (Minsk, Belarussia) and invited several prominent scientists to discuss the pheonomenon of ideomotoric drawing. Is it an art ? From all the opinions I’ve heard here, I can separate two main streams which are important. It was very interesting when mrs Alpeeva opened our round table asking us the question: ”Is it an art?” The second thing is that we wanted to look at the personality of the author and try to analyse how important it is for him as the way of self expression, the way of avoiding his personal problems, by getting these problems out, to be seen by the outside world. This fulfills the fractions of the bridge between those two worlds. His inside world and his outside world is what I am talking about. I see a kind of charm of post modern where everything is important, such a program of pluralism, and we think we cannot reject the charm of the graphical way, manners of these images. In our culture of post modernism, everyone is special. Everyone is micro-cosmos. So meeting every new micro-cosmos means increasing your universe. But I can also understand the feeling of dissatisfaction from the point of view of the artist, because every object dárt is following the rules of esthetics. Esthetics means beauty. Graphics in this case is a secondary factor. And this is just because graphical methods are a very powerful expression instrument such geniuses as Durer could work with this instrument, with graphics. 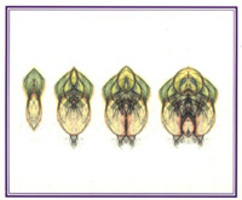 But we shouldn’t forget that symmetry is very important for our esthetical impressions of any drawing, so what Aster brings in his Angel drawings by using a mirror is a kind of element of esthetics what he does not put in from the beginning but during the process, in the final stage. Look at the colours, his original work is black and white, it really lacked colours. So he added colours and now the beauty came. I’ve got an impression that consciously or unconsciously Aster is still controlling the image. Maybe for one second or for a short period of time, but he still controls the image. And I cannot persuade myself that this is purely unconscious, that this is pure unconsciousness. At least I cannot agree with this statement without doing further research. I don’t know if he will agree on it or not. So collegues, we see here two aspects. The first one is that if these drawings are the subject of art, it means that they’re beautiful, that they bring the element of esthetics and beauty with them. So they go together with our idea of esthetics and beauty which is usual for our society, for our culture. If they’re beautiful, how beautiful are they? This is something what everyone has to decide for himself. If we see it symmetrically, full of colours, it is all very dependent of our ideal of beauty. We have our own ideal of how it looks for us and what our impression of beauty is. Tastes differ as they say. So from this point I think we should stop our discussion about these works as the objects d'art. Now I would like to talk about the symbols. I think that symbol is the most pure example of what we see here. 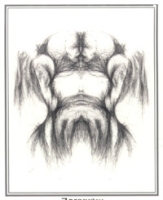 But I don’t think we can research and make any analysis of his personal and mental state through these Angel drawings. I don’t think it would be possible. Even the surrealism which the author is referring us to is not the reflection of the internal spiritual world of the author. Think about the works of Salvador Dali, some of his works, the example his tempting of his future wife with mixing ingredients; yes, this can be seen as an expression of his personality, but is it an art ? No, I don’t think so. So I think that for the author of these automatic drawings what he does is really important, it is of vital importance for him, but after I looked at these angel drawings from a professional point of view, I don’t think he can be our patient.The answer is no, he is not our patient, because we don’t see any pathology, there is no need in treatment or even psycho-correction. He needs to keep drawing trancendentally, ideomotorically, automatically, he should continue angel drawing; this is a type of personality strongly oriented on internal world. Self expression is very important for him. He is writing here that he could stop drawing Angels, but it’s not true. I wouldn’t advice anyone to propose to him to stop drawing, but in general I must admit that this idea already came to my collegues. This is a good reason to have a dialogue between us.